Studio Shed was born with a Do-It-Yourself drive. Our company founders, and everyone on our whole team love getting their hands dirty and the satisfaction derived from a job well done. For those of you who know what we’re talking about, a Do-It-Yourself (DIY) Studio Shed kit is for you. It’s more affordable than our full-service installed options, and a complete kit creates tremendous value and time savings compared to purchasing materials individually from a hardware store. Studio Shed’s panelized system installs cleanly and efficiently, maximizing your return on your most important asset – your time. Our kit ships with everything you need, along with a short and specific list of inexpensive and commonly available supplemental items. Every DIY shed kit purchase includes our instruction package of 3D animations of key steps, a video of a complete installation with instruction from one of our professional installers, and detailed drawings of each step in the process from start to finish. A Studio Shed DIY kit is also an excellent option for homeowners who have their own trusted contractor. We will provide them with the same tools and support we provide homeowners. A DIY shed kit from Studio Shed is the fastest and most affordable way to add extra space to your home. There’s no need to wait on a contractor to schedule your installation, and our panelized system goes up easily and quickly: Siding arrives painted the color of your choice, all windows are pre-hung, and our prefabricated wall and roof panels fit seamlessly together. Our unique VistaLite and CloudLite windows coupled with custom made aluminum trim throughout give the avid DIY’er an opportunity to build something far more refined than what is possible with off-the-shelf materials. 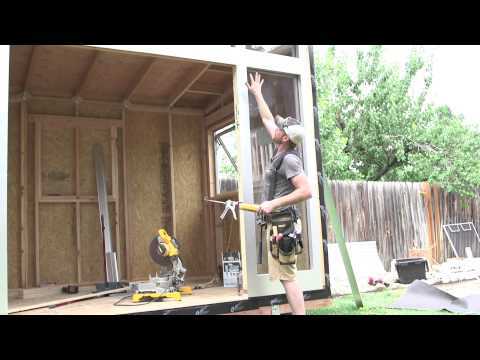 Building your own backyard structure with a DIY shed kit from Studio Shed allows you to save money, experience the satisfaction of a job well done, and enjoy some extra space at the same time. Get your hands dirty, but not too dirty.